Our meeting in July will open with a short recital by the young Italian guitarist Gian Marco Ciampa. The rest of the meeting will be Open Mic. Gian Marco Ciampa was born in Rome in 1990 and graduated with top marks and distinction with Arturo Tallini from “Santa Cecilia” Conservatoire in Rome, where he is currently attending a postgraduate two-year course in Concert Practice. Since he was a child he has taken part in and won several music competitions both in Italy and abroad (Omis International Guitar Competition, International Competition “FerdinandoCarulli”, International Competition “Giulio Rospigliosi”, International Competition “Anemos”), receiving in recent years also prestigious awards: among others, the first prize at the European Classical Guitar Competition “Enrico Mercatali” (Gorizia, Italy) in 2013 and at the International Competition “Niccolò Paganini” (Parma, Italy) in 2012. Since he was very young Gian Marco has played concerts at important venues and festivals all over Italy and Europe; such as the Sala Sinopoli of the Auditorium Parco della Musica and the Sala Accademica of the“Santa Cecilia” Conservatoire in Rome, the Chiostro di Santa Cecilia (San Giacomo Festival) in Bologna, the Casa della Musica in Parma,the Chitarrissima Guitar Festival in Torino, the Teatro Manzoni in Pistoia, the Palazzo Chigi Saracini (Accademia Chigiana) in Siena. Several important Italian newspapers and magazines (La Repubblica, La Nazione, Il Tempo, Il Corriere Della Sera, Dotguitar, and Le Cool) have featured articles and interviews about Gian Marco and his talent. 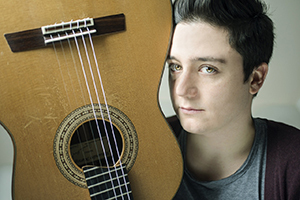 In 2006 he was chosen – out of thousands of applicants – as one of two young guitarists who were invited to perform live on the ItalianTV show “Domenica In – Ieri, oggi e domani” (Rai 1), hosted by famous Italian TV presenter Pippo Baudo under the musical direction of Maestro Pippo Caruso. In 2011 he was selected to take part in the guitar course held by Maestro Oscar Ghiglia at the prestigious Accademia Chigiana in Siena, where he graduated with merit as well as receiving a scholarship as one of the best students. His performance in front of the highest Italian political authorities at the Quirinale Palace in Rome on the International Holocaust Remembrance Day (27 January 2013) was broadcast live on Italian national television (Rai 3). Gian Marco also works as a music producer, arranger and electric guitarist. Over the past few years he has also been teaching both classical and electric guitar in several music schools in Rome.